and what a mixed pair they are. 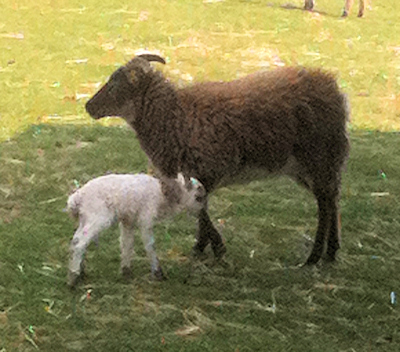 Two of our Boreray ewes have had beautiful lambs this year but they really are a bit mixed up. Twix, our Chocolate Ewe had a white Lamb with a chocolate band round his next and Suzie, our white ewe had a chocolate lamb. 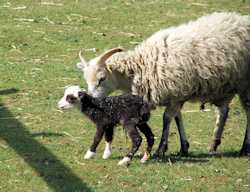 Its a real life Miracle.... At 6am this morning, we discovered that Twix, our brown Boreray ewe had been the first to lamb but she was very distressed as there was no sign of the lamb. After hours of searching all we could find was the afterbirth and close by next to the fence was two trails of blood. We were convinced that the fox had had our first Boreray Lamb and were devastated! 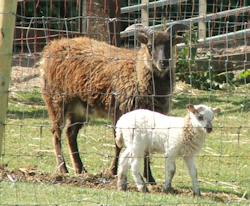 9 hours later, Twix, jumps a 5 ft fence, getting out of her enclosure and goes racing up the field and there from nowhere is her lamb on the other side of the fence, after catching it and reuniting Mum and Baby, they bonded immediately with baby suckling well! This amazing little ewe lamb has been on her own for 9 hours!! Its a miracle.